Alan was born deaf, is a consultant in educational management and a freelance teacher/trainer, as well as a NVQ assessor/verifier. He was previously employed in mainstream tertiary education management and was Head of Service, Additional Learning Support. He is currently a Governor of Frank Barnes School for Deaf Children, a member of its Curriculum Committee and on the Board of the British Sign Language Broadcasting Trust. He is a member of the Chartered Institute of Management. 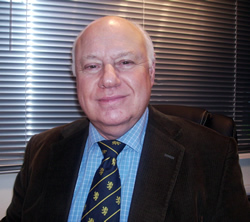 He has been involved in many charitable boards including the British Deaf Association for 16 years and for the last 3 years as its Vice Chair. Alan wants to unlock deaf people’s potential for employability, entrepreneurship and to share his belief that deaf people ‘can succeed’ in their chosen field.He was recently awarded an MBE for his services to deaf people.